Moving an historically low-performing school with a diverse and transient student population to personalized learning was a daunting task. The Naylor staff chose a step-wise approach that, over several years, has set the school on a very different trajectory that is more aligned with student needs while contending constructively with a diminishing budget. Naylor enrolls approximately 700 students from the surrounding neighborhood. Naylor is a turnaround school with low achievement. Historically, by grade 3, 60% of students had fallen behind grade level in reading and math. Naylor is facing the challenge of a highly mobile population while fighting to retain students attracted to the large number of magnet schools. As an added challenge, the district faced budget shortfalls as a result of declining enrollment and flat funding. The district (Hartford Public Schools) wanted to turn around Naylor School and shift the educational experience of a changing neighborhood and its population of students by providing a different instructional response: an emphasis on personalized learning. It started with a careful review of systems and structure to allow instruction to become the driver of change. After putting in place the structure and systems necessary to turn around the school, Naylor was able to focus on culture for learning. Teachers worked as a whole and in teams on their positional power to affect change. Teachers’ mindset was at the core of this cultural change. Their reflection was guided by the following question: What do I need to improve on as a teacher to be able to meet the needs of this student? Teacher collaboration in a weekly half-day session is at the core of the Naylor change. Within the collaborative — named Naylor U — teachers in grade-level teams hold data conversations, review student work, plan together, review video of their practice, and conduct instructional rounds. This transformative experience is the vector for personalized learning, increased student engagement, and real-time repair and academic acceleration opportunities for students. As a result of academic gains for students at Naylor Elementary in the 2014-2015 school year, all qualifying staff members received a financial bonus in September 2015. Beyond contractual requirements, central office only requires use of Powerschool for master scheduling. School choices are limited by the restrictions of the tool. Hartford Public Schools has a "no electronics" policy. Naylor has applied for a policy exemption to authorize BYOD (Bring Your Own Device). Each grade-level team is provided with an iPad lab (40 iPads each) and access to one of the school's seven labs. Science instruction utilizing Moodle for online/flipped classroom is in development. State policies impacting Naylor include teacher certification and labor policies as well as state-mandated testing requirements (see assessment). Data analysis with driving questions: How do students, parents, and staff enter the place of learning? How do staff and students operate in the place of learning? How does the school partner with the neighborhood? Hiring of operations manager to increase time for instructional leadership. Institutional professional development led by members of the Academic Leadership Team (teachers and administrators) with professional readings becoming regular features. For literacy K-5, Naylor uses National Geographic Reach for reading, augmented with additional leveled readers. In grades 6-8, Naylor follows the district resources: Expeditionary Learning. For math K-4, concepts are taught first, using Contexts for Learning Mathematics. Math processes are taught and practiced, using enVisionmath. For grades 5-8, algebra (aligned with the nearby neighborhood high school) is taught, using Eureka Math. Naylor has led the design of the scope and sequence and instructional windows for both math and reading, aligned with state priority standards. The core instructional approach for literacy is guided reading with an across-the-board, uninterrupted 120-minute literacy block (read aloud + reading centers). Math is taught using the same approach: 90-minute block with a 20-minute mini-lesson/and or exploration, followed by math centers (70 minutes), including some district-mandated online program resources (i-Ready). Hartford Public Schools is mandated by the state of Connecticut to use Northwest Educational Assessment (NWEA) Measures of Academic Progress (MAP) assessment (reading/math) as a measure of student growth while Smarter Balanced Assessment is rolled out. Kindergarten through grade 3 is mandated to use DIBELS in addition to MAP. The spring 2015 assessment for Naylor shows an average growth of >125% with 95% of students reaching their goal targets (targets are set at 100% growth for students on or above the 50th percentile, 125% for students ranging in the 21st to the 49th percentile, and 150% for students at or below the 20th percentile). The grading system at Naylor is transitioning to a standards-based approach, which is based on a 1-4 rubric. For the purpose of clarity, a double scale is offered for graded assignments. Report cards are standards-based with information about continuum of learning toward mastery, with students starting at "Not Yet." The Dr. James H. Naylor/ CCSU Leadership Academy is a pre-K to 8 neighborhood school serving students in the south end of Hartford, Connecticut. The school is organized into two small schools and a pre-K autism Applied Behavior Analysis (ABA) program. Grades pre-K-4 (500 students) is organized into traditional grade-level teams. Each team has a special education specialist that pushes into the classroom or co-teaches and an ESL teacher. Each grade has three or four self-contained classroom teachers. In grades 5-8 (175 students), teachers are organized by department: STEM (math and science) and humanities (social studies and English language arts). There are two special education teachers and one ESL teacher supporting the grades 5-8. Teachers instruct 4.5 days a week and collaborate in grade-level teams (K-4) or departments (5-8) in Naylor U weekly for half a day. When teachers collaborate, the Naylor U team provides students with literacy, robotics/language acceleration, or repair opportunities (decided by classroom teachers, based on data review and need). Hartford Public Schools practices full inclusion of students with an IEP (Individual Education Plan). Students with IEPs are served in mainstream classrooms with push-in support from specialists. Additional service is provided during Naylor U time, based on IEP goals and placement hours. Some occupational therapy support is provided in addition to academic mainstream support. English language learners receive English Language Development (ELD) support in both a mainstream setting and in dedicated ELD classes (specifically for newcomers at the beginning level or early intermediate). Students in grades 6-8 receive additional support through the Middlebury Newcomer Language Program. 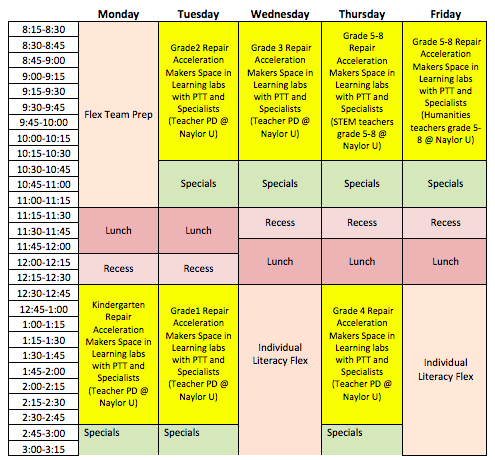 This schedule shows the shift to a 120-minute, uninterrupted literacy block across grades. During that time, students can "walk to read" for a personalized experience. In addition to the literacy block, a literacy flex period allows teachers to deliver any Tier 2 instruction as necessary. The 2015-2016 student schedule provides an example of how students are instructed during the half-day collaborative (Naylor U). Students experience personalized learning on a six-week rotation. The elective is included in that time. Time is dedicated for STEM (science and math). 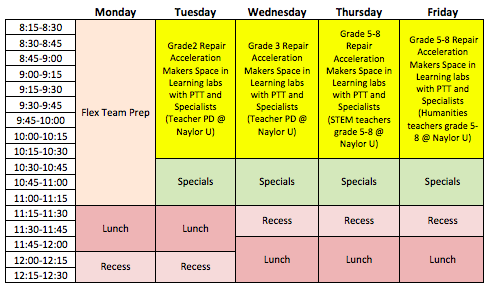 This staff schedule is an overview of the half-day rotations reserved for collaboration among teachers in a grade-level team or by content (for middle school). Staff in their grade-level teams receive ongoing professional development weekly. Job-embedded teacher collaboration in Naylor U is half a day. Professional development is led by the instructional coach and is crafted to respond to the needs of staff in relationship to student work and identified needs. Creating a sense of community with students involves using Positive Behavioral Interventions and Supports (PBIS) as a student management philosophy and program. Students are rewarded for behaviors consistent with the Naylor Knights code of conduct. Beyond that, a sense of community among students was created through traditions like the singing of the school song before school when all students gather in the atrium. Annual events like the Taste of Naylor, a food and culture extravaganza celebrating the rich diversity of the community, also serve as community builders with students, faculty, and families. Teacher performance is tracked through the Teachscape tool based on the Danielson Framework. About 10% of Naylor's staff is highly effective, 70% is effective, and 20% is minimally effective. The teacher goals based on student outcome (40% of teacher evaluation) match the student growth performance in the classroom. Teachers collaborate by grade-level team for three hours weekly in what the school calls Naylor U. Teachers develop lessons together tied to the Common Core State Standards (CCSS) and analyze student work using the lesson study process developed as part of the Bill &Melinda Gates Foundation's (BMGF) Innovative Professional Development (iPD) initiative. The teachers access lessons and tools on the Literacy Design Collaborative website, including lessons in core tools. Central Connecticut State University (CCSU): teacher preparation, including courses and practicum onsite, and Action Research, focusing on science lesson studies. Naylor staff members teach a college course. The University of Connecticut Aspiring Principal Program (UCAPP): a leadership preparation/certification program. The University of Connecticut Middle School Science program: a science program embedded in the regular course as well as a summer science camp and an after-school science camp. Yale University Literacy and Academic Success for English Learners through Science (Lasers) program: science instruction for EL students in pre-k and kindergarten. Middlebury (College) Interactive Language program (MIL): blended program pilot for newcomers who are English learners and Action Research. Families can get involved at Naylor through a School Governance Council (SGC) that meets monthly and the Parent Teacher Organization (PTO). Back-to-School Night, family literacy nights, and parent-teacher conferences are well attended because of intentional efforts by administration and staff. Teacher teams send home monthly newsletters that are translated into three languages, and staff members make home visits to partner with families. Naylor has a large Bosnian community, so the principal meets regularly with the religious community leader (Imam), and the school has hosted Bosnian events to further engage the families.